Chart No. 53 - Checking For the Tense Leg and Hip Which Is Usually the Short Leg and Releasing It By a Torque and a Rhythmic Movement. Fig. 1 illustrates the test on both feet. One resists more and does not go freely towards the median line when pushed gently with a finger. Sometimes the test has to be outward as well, to compare tension and resistance in the opposite direction when present. Fig. 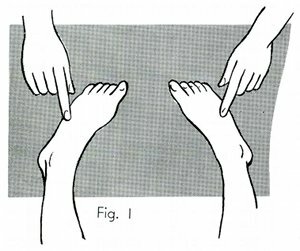 2 places the foot and leg with the greatest tension, in a position toward the median line, by lifting the foot away from the other and rotating the thigh gently toward the middle to take out all the slack. No force is used. It merely lays the leg in the right position. The hand from the foot (Fig. 2) is brought on the inside of the thigh and holds rotated position. Fig. 3 shows the lower hand on the inside of the thigh and the other hand spread out on the abdomen with the thumb above the symphysis pubis [pubic symphysis] on the abdominal muscles to control the direction. 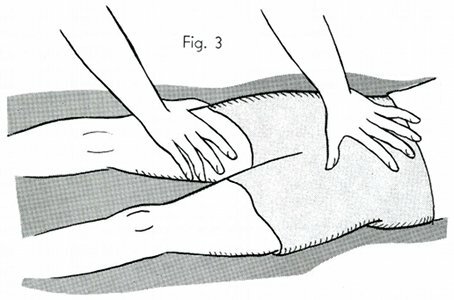 Now a light rocking motion is started in which the patient's body rocks as a whole until the tension of these muscles is released. There is no thrust, no force, and no push. Spams of the right anterior thigh muscles indicate liver disturbances. Spasms on the left anterior thigh muscles a stomach block.